Nathalie does not know her biological parents. 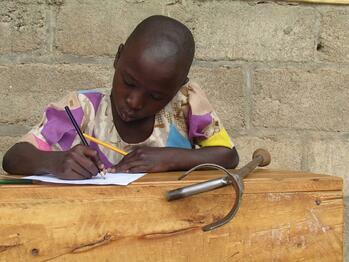 She lives with her adoptive parents, Francis and Christine, in Kigoma village in southern Rwanda. Nathalie was discovered when the neighbors heard a newborn crying all night - they woke early to check where the cries were coming from and found little Nathalie. “She was dehydrated, and almost dead, but the neighbors took her, nursed and raised her up to today,” Valentine continues. Those ‘neighbors’ became her parents. When she was old enough, Nathalie’s parents took her to school. She had to crawl because she didn’t have a wheelchair. She needed aid from students to help her access the lavatory and she struggled to use lavatories that were not disability-friendly. The head teacher went to World Vision to advocate for Nathalie, and World Vision intervened promptly. “World Vision first took Nathalie to a specialized orthopedic center. She was operated on and spent nine months at the center. Though she did not recover completely from her immobility, at least she uses a crutch and her legs are no longer curved with webbed skin,” says Beatrice, Nathalie’s teacher. After ensuring that Nathalie received medical treatment, World Vision constructed school latrines. They built one latrine for students with disabilities and another for those that needed menstrual hygiene support. 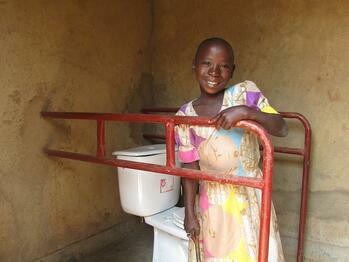 By the time Nathalie returned to school from the hospital, she had easy access to a disability-friendly toilet. Nathalie shows off her accessible lavatory at school. “I feel special because now I can move myself and I do have a special room that meets my hygienic and safe sanitary experience,” Nathalie says. “I used to be bullied at school during break time, especially when I needed students to carry me to the lavatory, but now, I take myself and have a dignified lavatory for me at school,” she testifies. “We never had toilets designed to suit the needs of students with special needs. World Vision enabled us to increase safe accessibility for people with a variety of disabilities or mobility challenges,” Beatrice adds. “I became the third best student in class last semester, and I want to be the best in the next semester. This is because I now feel comfortable with the school environment, especially when it comes to my privacy needs,” Nathalie shared. “I have a dream to become a Catholic nun, so I can serve God all my life because God saved me and gave me hope for the future and dignity among others,” Nathalie continues. “We thank World Vision so much for the dignity they bring to our children, including those with disabilities. Nathalie is the best example of this,” says Beatrice.